SAN FRANCISCO — Frustrations peaked during the San Francisco County Transit Authority’s open house-format meeting Nov. 5, focused on the Geary Bus Rapid Transit’s draft environmental impact report and statement. Held at the Event Center at Saint Mary’s Cathedral, members of the public were invited to study and comment on the proposed $250 million plans to improve transit operations and streetscape environment of the Geary Corridor, one of the busiest thoroughfares in San Francisco. The meeting gave attendees an opportunity to speak with transit planners and to submit comments or questions on the draft environmental impact report and statement, but did not have an open mic public comment session, which left many attendees frustrated. David Heller, president of the Greater Geary Boulevard Merchants and Property Owners Association, interrupted the overview presentation, saying, “I cannot speak!” He complained that his comment would not be heard by everyone in the room. Heller was concerned about the economic impact construction would have on businesses along Geary. He said that the project’s staff have “their minds set on the direction they want to move” and community opposition will not change their minds. The project aims to install bus-only lanes and other improvements to improve travel times, according to the SFCTA. Along with bus travel times, the SFCTA plans to make streetscape improvements to the roads to enhance pedestrian safety. One such improvement, however, has attracted considerable pushback from the Japantown area. 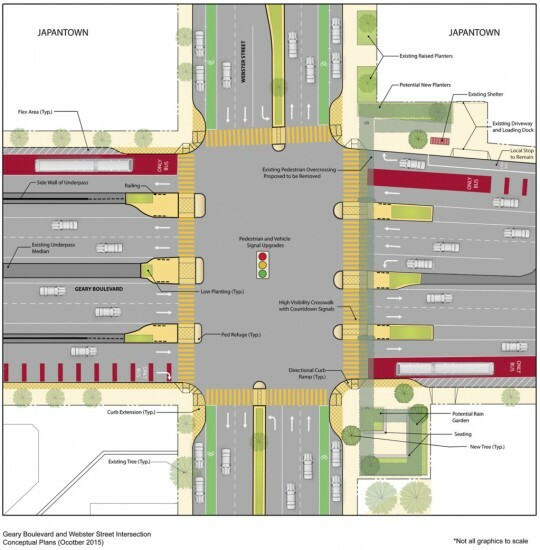 In its current suggested design, the project would remove the pedestrian bridges and install surface-level crossings at Webster and Steiner streets, and another crossing where Buchanan Street would meet Geary Boulevard if it ran through the Japantown Peace Plaza. The Webster Street Bridge in its current configuration does not comply with the Americans with Disabilities Act because the ramps’ slopes are too steep, according to SFCTA staff. Any construction that would touch the bridge would either require it to be redesigned to be code-compliant or demolished. Many local residents and community members attended the presentation to oppose the bridge’s removal. Among them were staff and members of the Japanese Community Youth Council, the Japantown Task Force, and parents and staff from Rosa Parks Elementary School. All three entities have maintained that the bridge’s removal would endanger children crossing Geary. Paul Rainville, whose son attends the Japanese Bilingual Bicultural Program at Rosa Parks, said he opposes the removal of the Webster and Steiner Street bridges. He was primarily concerned about the high rate of speed cars travel on Geary and having to cross 10 lanes of traffic (including the proposed bus-only lanes). While there are three 10-foot-wide pedestrian islands proposed for the crossing, Rainville was skeptical that it was safe to take 20 kindergartners across the street at street level. The school frequently takes children across the bridge on field trips to Japantown and the Western Addition Library north of Geary. “All it takes is one kid to not pay attention,” he said. Attorney Robert Rusky said he was frustrated with the insistence that the Webster Street Bridge be demolished, as the bridge could have cultural significance to Japantown. Rusky was active in the creation of the Japantown Cultural Heritage and Economic Sustainability Strategy, a city-approved document for the ethnic enclave’s cultural and economic development. He said talk of removing the bridge has raised questions as to whether it holds any cultural significance or not. Rusky said the bridge, aside from the safety issue, provides a unique vista of the area and could serve as a landmark for the ethnic enclave. The bridge connects the north and south side of Geary, which had been split during the redevelopment era of the 1960s, when the street became an eight-lane thoroughfare. Rusky is not alone in his opinion. Several board members of the Japantown Task Force have also previously pointed out the potential for historic or cultural significance in its monthly meetings. Young, however, said BRT has been “completely sensitive to the needs” of the community, citing an additional pedestrian refuge on the crosswalk. “The whole nature of the intersection will be different under this plan,” he told The Nichi Bei Weekly. With a reduction in regular traffic lanes and a more pedestrian-friendly design, he expects cars to slow down once the project is completed. With respect to the bridge’s potential cultural significance, Young said its removal would create open space where the landings for the bridges currently are, and provide a potential site for public art, though no plans have been formally introduced as of yet. Other complaints and concerns within the Japantown area include the potential noise and dust from construction and the loss of parking spaces. Young said construction would follow “prescribed practices” to control dust and also maintain access to the streets and mitigate impacts by avoiding construction during peak hours. As for the on-street parking loss, Young wrote that the staff-recommended alternative for the project would reduce parking by three percent in the Japantown-Fillmore Street area. “The project has conducted an occupancy survey and found that the three-percent loss is less than the number of vacant spaces in peak-usage times,” he said in the email. Hashimoto said he supports the parking plan as a member of the CAC in order to improve the efficiency of bus service, but disagreed with the removal of parking spots from a community perspective. “I do not agree with any removal of parking spaces that would have an impact on not only businesses but festivals as well.” He also opposes the removal of the pedestrian bridge. The statement also said the 45-day comment period had been extended to Nov. 30 and that anyone concerned about their comments being lost in the incident should contact the SFCTA. Following the report’s finalization in mid-2016, the project will begin construction and aims to formally begin service in late 2020. Questions or comments may be submitted to [email protected] or by mail to the San Francisco County Transportation Authority, Attn: Geary BRT, 1455 Market St., 22nd Floor, San Francisco, CA 94103.